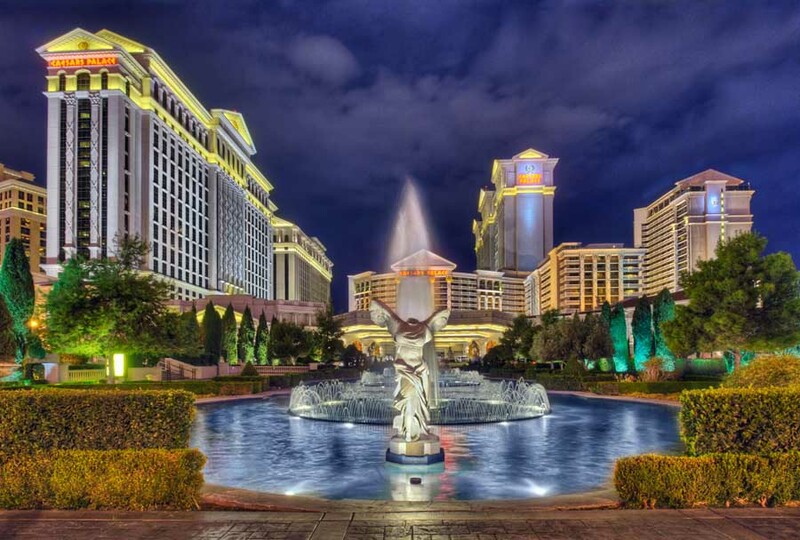 For eras, the Las Vegas Strip has been the main center of the magical architectural design. Developers involve their talent in creating and experimenting with new things to attract people to the Mojave Desert. From decades it has been one of the most budget buildings with millions of people to get entertained here. Also, the Las Vegas Strip stands unique in its layout with an innovative architectural design when other companies struggle hard to compete with each other. The architecture makes the buildings of similar services (gambling, accommodation, entertainment) look different. With the advent of Internet, casino online has become very popular thus increasing the consciousness of general people to a great extent. The three main architectural elements involved in the Las Vegas War are – the 1950’s pool race, 1960’s sign race and 1970’s porte-cochere race. During this time period, a simple rectangular swimming pool got enhanced into a letter-shaped oasis with wonders of underwater cocktails and Muzak. The sign that was previously made with a pole and box, evolved into a 20-story tall structure with miles of neon. The porte-cochere that was traditionally a wooden entrance big enough for a vehicle, now have grown into a vast area like a football field with mirrors and lots of light bulbs. However, casinos weren’t measured just by their fully erected signs’ length. The Dunes sign has gained a reputed place among sign designers for its specific design, usage of positive-negative spaces, usage of light that makes it look taller than its real height of 181 feet, filling the whole area which you’re looking at. Las Vegas developers slowly but steadily widened the remaining low-rise casinos with high-rise towers. As Las Vegas sky is crowded with large buildings, vertical signs make less impact here. The porte-cochere isn’t visible from afar though, but it brings the guests to an elevated state from up close, shining with all those mirrors and bulbs underneath. Thus by the late 1970s, the developers replaced their priority from neon vertical pylons to plastic horizontal planes with utmost splendor. The buildings at the strip seem to have in a competition of being best, each with some unique charms. Arrival of casinos online has not decreased the demand of these physical casinos in Las Vegas. 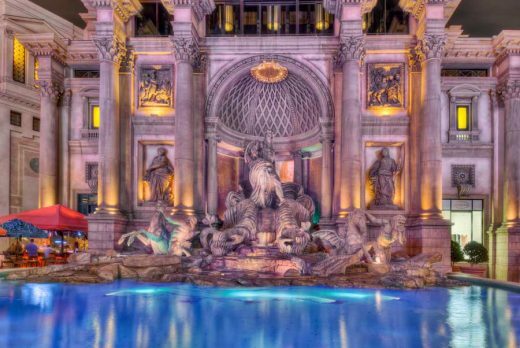 Here’s a list of the most amazing and exotic hotels and casinos on the Las Vegas Strip. It’s the tallest building in Las Vegas, perfect for witnessing the skyline. It includes a 1,149ft observation tower that is the tallest in the US. Along with the live shows, great gaming, restaurant, and shops, they have an additional amusement ride that’ll take you hundreds of feet in the air with void below! Also, they get a bungee-type ride. With it, people can drop themselves 885ft attached with a fast descent wire. This building is totally worthy of your visit. It’s the oldest building in the strip that was built in the 1940s. It has the unique “art deco” architecture. Opened by an infamous mobster Bugsy Siegel, this building still flaunts its flamingo-flocks in the outer lobby. This iconic hotel has made its place again and again into films and literature over the years for its exquisiteness. Started in 1998, this classic hotel has found its way into popular culture till now. It was built by Steve Wynn with a huge cost of $1.6 billion on the site of the old Dune hotel. It’s largely known for its famous lake and fountains that attract visions of all the visitors of the strip. The performances are merged with magical light and music. It also has the famous Dale Chihuly glass sculpture of glass flowers in the lobby, along with a conservatory and botanical garden. Also, it has been the permanent residence of “O”, the Cirque de Soleil’s production. This building is hugely popular for its architectural excellence. It has Venetian canals stretched up-to a quarter mile, giving you the feel of Italian romance. The canals are made alongside the canal shops. The pathways are made of cobblestone and illuminated with sky ceilings. All these marvelous features make the whole ground a paradise for shopping and entertainment. The whole casino and hotel have the vibe of Venetian theme and opulence. The building also includes architectural replicas of famous Venetian symbols like – the Venetian lion and Saint Theodore Columns, the Palazzo Ducale, Piazza San Marco, Piazza di San Marco, St Mark’s Campanile and the Rialto Bridge. This building is another icon of the Las Vegas skyline. It has truly the shape and architecture of an Egyptian pyramid. It has a spotlight shining from its pinnacle which is the brightest spotlight all over the world. The building is made of steel and black glass with a majestic height of 30-stories. Made for long 2 years, spending $375 million, it was opened in 1993. The hotel has become a symbol of post-modern architecture and has merged nicely with the popular culture. This building evokes the thought of 1940’s Manhattan skyline as you see it. The most amazing architecture of the hotel includes the lake that represents New York Harbor and the 46m replica of the statue of liberty. It has replica towers of the Empire State and Chrysler Buildings, Whitney Museum of American Art, the Soldiers and Sailors Monument, Grand Central Terminal and the Immigration Building on Ellis Island. The casino also expands this theme with several New York City landmarks and neighborhoods. People know the casino hugely by the name of Central Park. The Manhattan Express, a roller-coaster that represents the Checker Cab is another architectural marvel of the casino. This ride covers 180km/h in both external and internal parts of the hotel. 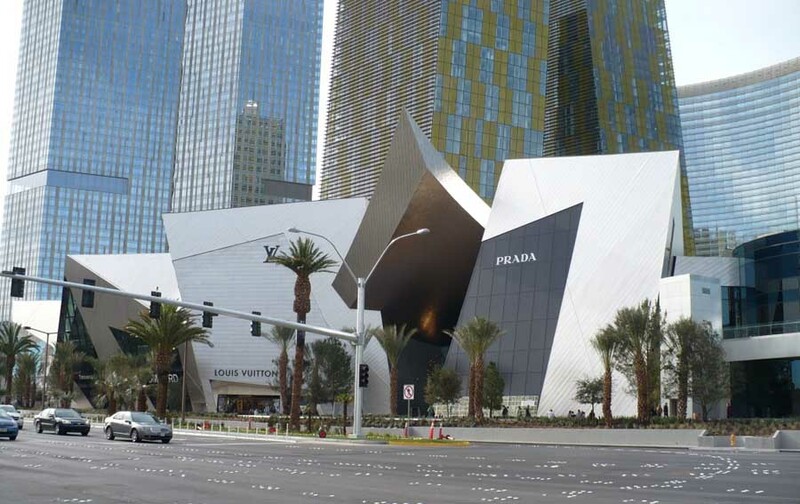 Started at the end of 2009, this hotel is the newest addition to the amazing hotels and casinos on the strip. This building has fantastic architectural advancements. It has façade that blocks heat while multiplying natural light along with several water reduction features. This proves to be the most energy efficient one. Being highly luxurious, it has secured its rank among top 5-star hotels. It flaunts architectural icons like jewel-themed ballroom, a sky lobby with stunning views and an express elevator.